Difficult to believe you can drink Kwak, Chouffe, Blanche de Namus, Duvel, Budweiser, Maredsous and many more in one place in Korat. Yes, you can!!!!!!! It is called "Prew" (Pronounce it "Pree-oo") which mean something like comfortable I think. Yes, I was comfortable!!! It is located at Bung ta Lua, near PEAK the badminton club. Not in the area of "Ozone" but closer to the Horse track. This place has been around for a while, maybe in a different incarnation. I used to drink Weissbier there. I was told it has been there for a year or so. For me, it was my first time. I am discovering new places because we moved on the other city of the city. I like it, but 200 baht a small beer is a lot. You can buy "Leffe" at Villa Market for 95 baht I think. I am fortunate enough to get Beer Lao Dark at about 25 baht a bottle (from the border and I can get some every month!!). 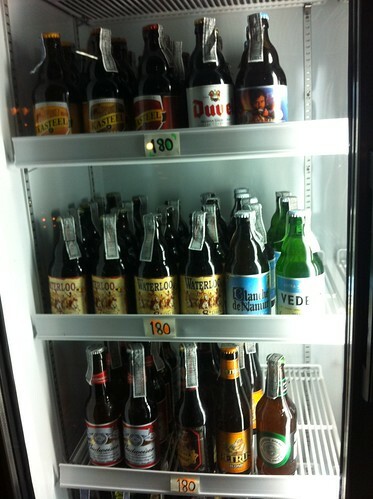 At 25 baht for Laos dark, I love Belgian beer but will keep it for special occasions! A new small Japanese restaurant beside tomodachi2, in front of gas station on Jomsurang road, or not far from Sports Bar, has written 50% of draft beer from 5pm to 6:30pm as promotion. I saw the sign today, it is in Thai in front of this place. Cafe Capu has also German beer. That is near The Ram. Paulaner can be bought at Blues 33 (excellent place) and Anego. I think Tomodachi 2 too. PB used to have some. Balu's too. I wish they had a micro-brewery in Korat. I still think it would work, but need a big investment.